The Gilbert Scott is situated in The Renaissance Hotel St Pancreas (previously the Midland Grand Hotel) which finally reopened last year after being closed for almost three-quarters of a century. In keeping with the style of the original architecture, the restaurant has maintained many of the ornate features of the building. With high ceilings, limestone pillars and intricate details. The Gilbert Scott feels grand, but also somewhat old-fashioned and sterile. The refurbishment of the dining room was undoubtedly expensive (the whole hotel cost about £150m), but I didn’t care much for the garish peachy colour scheme or the icy atmosphere of the restaurant. The restaurant is named after Gilbert Scott, the architect who originally designed the building. However it was the name of Marcus Wareing that I was most curious about. The two-starred Michelin chef of Marcus Wareing at The Berkeley is behind the brasserie and bar operations at The Gilbert Scott. The menu made for a nice read, and fittingly, resonated Britishness. The kitchen operated with clockwork precision, and eerily so. It only took a few minutes from the time we placed our orders until our starters turned up. The turnaround time was so quick it made me question the level of effort that had been made with our food. My first course of curry spiced mulligatawny with quail (£9) tasted like it had been pre-cooked and quickly reheated for service. The mulligatawny could have been hotter and better spiced. The quail was a nice touch, but as it had been immersed in the broth for some time it had become bland. This was an unremarkable dish. Cornish sardines (£8.50) were nicely cooked but came with pickled vegetables which were both too chunky and too plentiful for the size and amount of fish. There was almost more pickled veg than fish. The mains also turned up quickly. 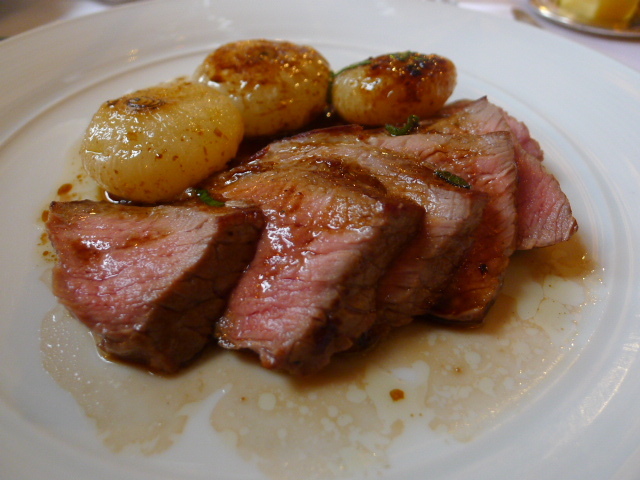 A meanly sized portion of rump of veal (£18.50) was nicely cooked and tasty, if a touch chewy. 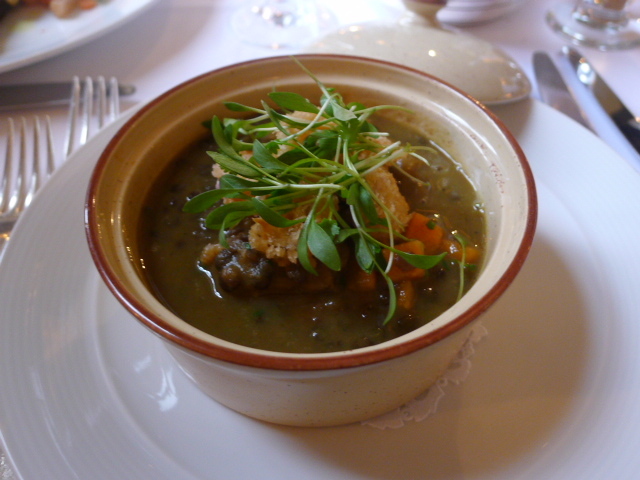 It came with some well roasted onions, wild garlic and sage which rounded off this tasty dish. 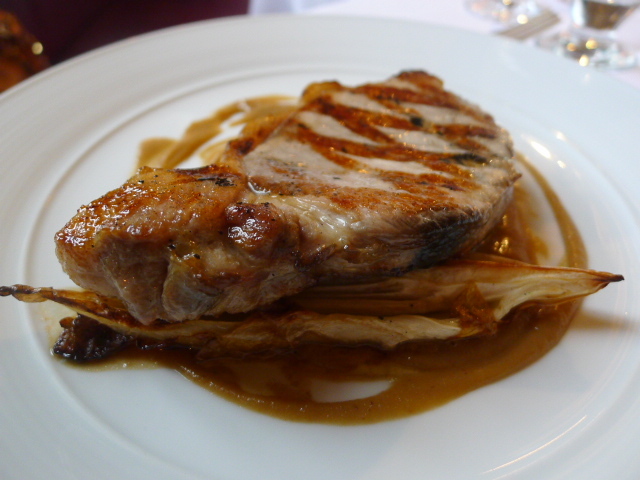 A char-grilled pork chop (£18) proved to be a little dry. The accompanying apple and celeriac purée was pleasant but had the texture of baby food. The cooking was reasonably decent but the dishes were uninspired and lacked creativity. Nor was our evening entirely leisurely or enjoyable either. The atmosphere at The Gilbert Scott was a little soulless and our sitting felt rushed. A paltry 45 minutes was how long it took for us to sit down, order and eat our food. Granted this was ideal if you’re in a rush, but it really didn’t give us a reason to linger and savour. And to make matters worst, the restaurant smacked an outrageous £2 cover charge per guest. I don’t begrudge a restaurant wanting to make money, but really? Perhaps expectation is the worst enemy, but when you consider that it’s the two-starred Marcus Wareing who has leant his name to The Gilbert Scott, I couldn’t help but think the entire dining experience something of a let down. Like I said, the food was fairly decent, but there are definitely better restaurants in London that provide both a more worthwhile and well rounded dining experience. My verdict – avoid Gilbert Scott. It’s really only good enough for the passing through traffic of foreigners who stay at the Renaissance Hotel and who don’t know what else London might have to offer. Price range: £30 – £51 for three courses. Excludes drinks and service. I’m going to be visting London at the end of November. I’ve booked this place for our Saturday evening when my sister is joining us. I don’t want to take her somewhere too expensive but still quite classy. I thought this with its, upgraded pub fare and grand surroundings would tick all the boxes but I have seen a couple on uninspiring reviews. 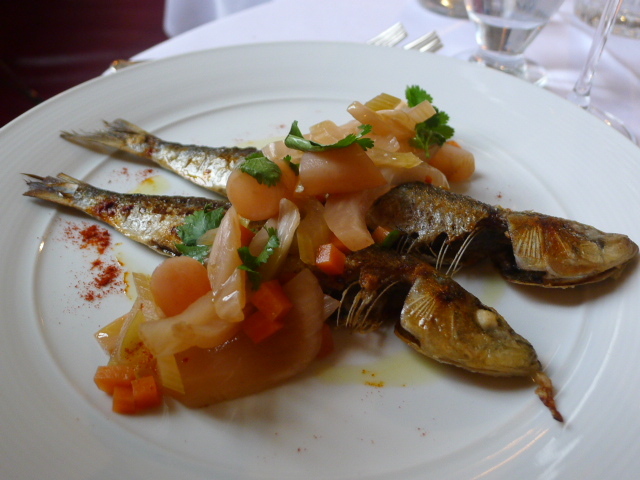 Try Brasserie Zedel. Its great for the price and it is suitably glamorous.